Is remembered for its motto: "Buy it by the Gallon"
On the 1st of November 2011, Hy-Point Dairy merged with the only other remaining dairy in Delaware, Lewes Dairy. Together the two dairies will be able to service a broader market with a more diverse product line. The Meany and Brittingham families look forward to a successful union of two proud traditions and years of service to customers throughout the Northeast region. Currently, we service the states of Delaware, Maryland, New Jersey, and Pennsylvania. We devote our efforts to provide our valued customers with the highest level of friendly and courteous services. We provide the freshest top quality dairy products available at the most competitive price. Additionally, you will find us giving out water or dipping ice-cream at many local events such as 5Ks, charity events, art festivals, and so many more. In the early 1920s, Grace and Emory Brittingham utilized their farm to produce milk for local customers. They had a couple hundred acres, a herd of Guernsey cows, six sons and a daughter. 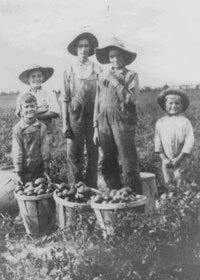 The unprocessed milk was cooled by a supply of local water, hand poured into bottles with a pitcher and delivered from the family car on the way to school. 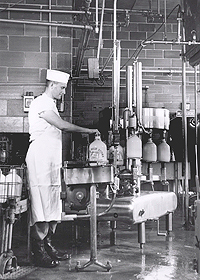 In the 1930s, they were the first dairy "below the canal" to switch to refrigeration, cooling systems, and pasteurization to eliminate bacteria. After Emory died in 1933, Grace ran the business until '42 when two of the five sons working at the dairy went off to serve in World War II. During this time, business was put on hold and picked up again upon the sons' successful return. Having survived both the Great Depression and the war, sons Archie and Weldon returned with a renewed determination to prove themselves. Along with their brother Bassett, they built a new plant and reopened on July 23, 1946, with a new name, "Lewes Dairy." Archie and Weldon believed in hard work, and their 16- and 18- hour days paid off. In 1955, they took the biggest gamble of their lives and introduced the 73-cent glass gallon jug of milk. House-to-house delivery was stopped July 1st, and tractor trailers delivered to the new chain of Dairy Markets and "Mom and Pop" operations in an effort to reach even more customers. Lewes Dairy's reputation was now well established --- known for its freshness and quality of its products. The dairy purchased milk from local farmers and fought the U.S. Department of Agriculture all the way to the U.S. Supreme Court to keep profits in the hands of the farmers. Today, Lewes Dairy processes a million pounds of milk per month. It is famous for its rich holiday Egg Nog and fresh cream. Restaurants from the shore to our nation's capital often proudly proclaim "We use only Lewes Dairy Cream!" On the 1st of November 2011, Hy-Point Dairy merged with the only other remaining dairy in Delaware, Lewes Dairy. Together the two dairies will be able to service a broader market with a more diverse product line. The Meany and Brittingham families look forward to a successful union of two proud traditions and years of service to customers throughout the Northeast region.